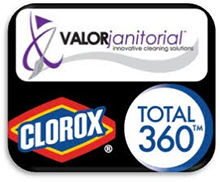 Get your first month of office cleaning service for free when you when you sign up for office cleaning services with Valor Janitorial. This special offer is valid on new two year office cleaning services contracts that total $4000 or more per month. Valor's office cleaning service includes team leaders that review and inspect each office cleaning to ensure our standards have been met or exceeded. Some of our other services include, 24/7 emergency cleanup and water damage restoration, heavy duty professional carpet cleaning, high gloss floor cleaning and polishing, nightly office cleaning that includes surface disinfection.